New Jersey moved closer to becoming the 11th U.S. state to legalize recreational marijuana use after legislative committees approved bills to end the prohibition and wipe out the criminal records of some drug offenders. The action puts the bills on track for all-but-certain passage by the Assembly and Senate on Dec. 17. While Governor Phil Murphy, a Democrat, campaigned in part on easing marijuana laws, he has criticized the legislation’s tax rate of 14 percent, which would be among the lowest in the U.S., making it unclear whether he will sign the bills or send them back to lawmakers with suggested changes. Murphy and the Democrat-controlled legislature are eager to make New Jersey the first state in the New York City region to fully legalize the drug, a step that has widespread support from residents and would provide a new source of needed revenue. 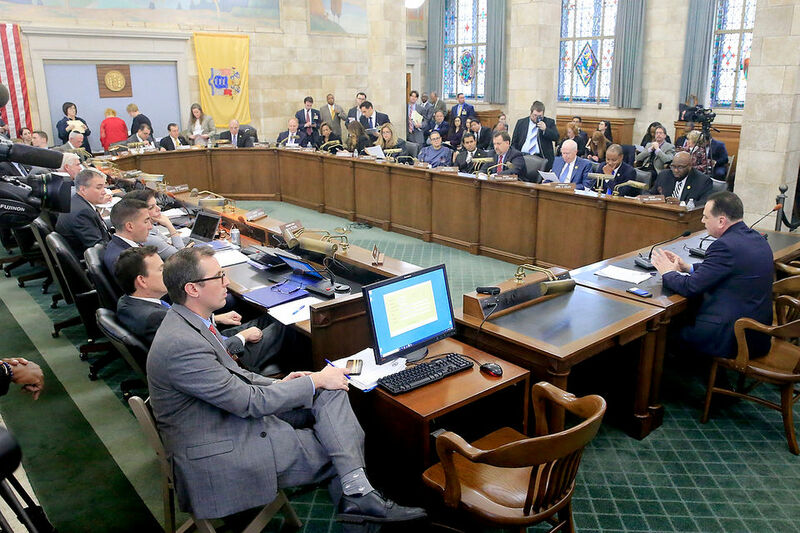 The bills received approvals Monday by a joint hearing of the Senate and Assembly budget and appropriations panels in Trenton. The Senators voted 7-4, with two abstaining, and the Assembly members, 7-3, with one abstention. “We have seen billions of dollars wasted on enforcement,” said Senator Nicholas Scutari, the bill’s sponsor and a Democrat from Linden. Cannabis prohibition flopped, he said, just like the U.S. ban on alcohol from 1920 to 1933. Opponents included Democrats and Republicans alike, with even Senator Paul Sarlo, a Democrat who heads the chamber’s budget committee, abstaining over concerns about use by children. A warning about the marijuana lobby’s power came from Patrick Kennedy, the former U.S. congressman from Rhode Island and son of the late U.S. Senator Ted Kennedy. Senator Gerald Cardinale, a Republican from Cresskill, said traffic fatalities increased in Colorado and Washington after those states legalized the drug. New Jersey’s automotive insurance premiums were highest in the U.S. for five straight years, averaging $1,264 in 2014, the most recent year analyzed by the National Association of Insurance Commissioners, a Kansas City, Missouri-based research and lobbying group. “Insurance rates on our drivers are going to have to go up,” Cardinale said. The move to legalize and tax marijuana is part of Murphy’s efforts to create jobs and boost the economy. The state’s finances have been strained by growing pension and debt bills that are projected to consume a third of the budget by 2023. His $37.4 billion spending plan for the fiscal year that started July 1, his first, contained more than $1 billion in new or higher taxes on sources including corporations, residents who earn at least $5 million a year and ride-sharing services. The governor had asked for a tax of about 25 percent on marijuana. The bill approved on Monday falls well short of that by setting the rate at 12 percent, with another 2 percent paid to municipalities where cannabis businesses operate. New Jersey’s marijuana tax, as proposed, would be among the lowest. Washington’s sales tax is highest, at 37 percent. Colorado’s combined taxes total 30 percent; Nevada’s, 25 percent; and Oregon’s, 17 percent. Michigan voters this month approved 16 percent total taxes. The legislation also directs the court system to expedite criminal expungements to address the disproportionate impact that drug laws have had on minorities. Assemblyman Jamel Holley, a Democrat from Roselle and member of the Black Legislative Caucus, said it was pointless to study expungement further when federal statistics reflect racial disparities in arrests. “People who look like me don’t have relief,” he said. The legislation also puts the cannabis industry in the hands of a commission appointed by the governor and lawmakers. Other legislation, approved by the Senate health committee, would broaden access to medical marijuana, which New Jersey has allowed since 2010. New Jersey is playing catch-up to other states in that area because Republican Chris Christie, a former federal prosecutor who was governor for eight years, was slow to implement policy for fear of violating U.S. laws that prohibit the drug.